Loksatta Founder President Dr Jayaprakash Narayan, National President Surendra Srivastava and National General Secretary Ms Hyma Potineni addressed the media today regarding party organizational matters and recent developments. The National President Mr Surendra Srivastava shared his pain and anguish at the recent turn of events that defamed the unblemished reputation of Loksatta and Dr JP. "Loksatta has always stood for high standards of conduct. This breach of decorum and discipline in public by my own Loksatta brethren with whom we have worked have over a decade has left me deeply aggrieved. Unlike other political parties, Loksatta's firm commitment to liberal values of debate and dissent have enabled us to provide umpteen internal party forums for all members and leaders alike to air their differences and arrive at well thought through solutions to achieve our common goals. Despite all the available internal resources and unlimited access to Dr JP and myself, when senior party leaders have acted with indiscipline, it not only fills us with pain, but we also are learning lessons and evolving the party as a stronger unit. We will succeed and establish Loksatta as the default platform of the youth of India!" Ms Hyma Potineni, the National General Secretary said, "Our President, Mr Surendra Srivastava has even invited Mr Varma and Mr Katari to stay at his residence in Mumbai and discuss and resolve differences amicably. He has himself traveled to Hyderabad and Guntur to reach an understanding and also invited them to join the National Teams to steer the party in the right direction with their experience. They have unfortunately refused to engage and further aggravated the situation through public defamation." Dr Jayaprakash Narayan said, "We are pained with the behavior of senior party members who have gone public with internal matters and forced this action. No one is indispensable. Period. The party is bigger than the individuals and the nation is bigger than the party. Loksatta will march ahead with momentum as the platform for the young people of India. The National President Mr Surendra Srivastava and his national team will take the party forward. This matter is closed." He also added, "Loksatta has the historic role of defining new politics and involving the youth and new faces in transforming political culture. Surendra Srivastava will now announce the new Loksatta AP State Unit leadership." The National President Mr Surendra Srivastava announced Dr Pattabhiramaiah as the Interim AP State President and Mr Bheesetti Babji as the Interim AP State General Secretary. "After extensive consultations with all key stakeholders and leaders, and with Dr Jayaprakash Narayan's considered opinion, we have arrived at the new leadership team. Dr Pattabhiramaiah is a founder member of Loksatta and a long standing and highly respected public personality in Krishna Dist and is deeply imbibed of Loksatta values. Mr. Bheesetti Babji is also a founder member and a grassroots leader who has fought many a battle against the mighty and powerful corrupt elements in the highest echelons of our government. Under their able guidance, I’m confident the A.P state unit will soon be able to rally itself out of the internal chaos that has reigned in the past several months and focus instead on public interest and party building." Dr Pattabhiramaiah, the Interim AP State President said, "I have been asked to stand up and take charge at a time of need for Loksatta and I will do everything in my ability to grow the party." 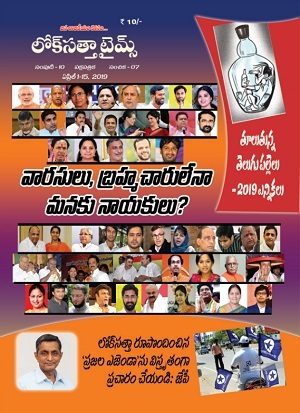 Mr Bheesetti Babji, the Interim AP State General Secretary added that, "The need of the hour is for Loksatta to take the true causes of the people of AP and that is exactly what we are determined to do." LSP ended in Telangana after it spewed venom on the Telangana movement. 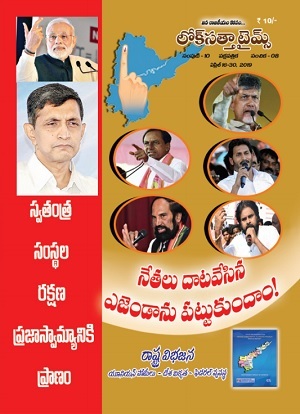 Now it is curtains for you in Andhra also. Good bye, self proclaimed intellectuals!